Are you tired of stretcher bars joins that don't form a perfect 90° angle? Do the poorly cut edges of your stretcher bars give you splinters? Do you notice the wood bowing along the “straight” edges of your canvas? How do you feel about ghost lines in your painting from your canvas pressing against the stretcher bar? To learn more about BEST stretcher bars and other Jack Richeson products, we welcome you to explore, learning more about the BEST stretcher bars and accessories you can buy! Best Artist Products began in 1979 with a single product: a heavy-duty wood canvas stretcher bar for professional painters. The intent was to develop a product that would significantly improve the wood bar that was popular at that time. The end result was a heavy-duty canvas stretcher bar system with a 1/2 inch rise on its outside top lip to separate the stretched canvas from the interior edge of the stretcher frame with corners that allowed for keying to stretch out. Today, BEST designs are an industry gold standard for excellence! The Super Bar is truly that—a very super bar. The Super Bar is made of pine that has been finger spliced. Finger splicing is a method of bonding pieces of lumber together to for a very long, very straight bar. Since the spliced joints are actually stronger than natural wood, we can now get longer, stronger, and straighter bars than ever before. First designed for the construction industry, this high tech method yields the best bars. Beautifully straight bars from 8″ to 12′! While available in lengths as short as 8″, BEST Heavy-Duty and BEST Aluminum bars should always be used for paintings with dimensions exceeding 47′. Unique to Jack Richeson & Co., Inc.—Aluminum Gallery Wrap Bars allow the artist to wrap the canvas all the way around the bars and secure on the back to achieve a nice flat surface against the back. The profile of this bar is so elegant, your canvas doesn't need a frame. A strong and beautiful combination of aluminum and wood has the appeal of traditional canvas stretching while giving incredible strength and longevity to the frame. Frame will not warp or change from seasonal or climate changes in humidity and temperature. The recycled aluminum inner frame keeps outer wood frame from warping, expanding, or shrinking. BEST Aluminum frames are easy to assemble with Aluminum Corner bracket inserted into channels in the aluminum frame. 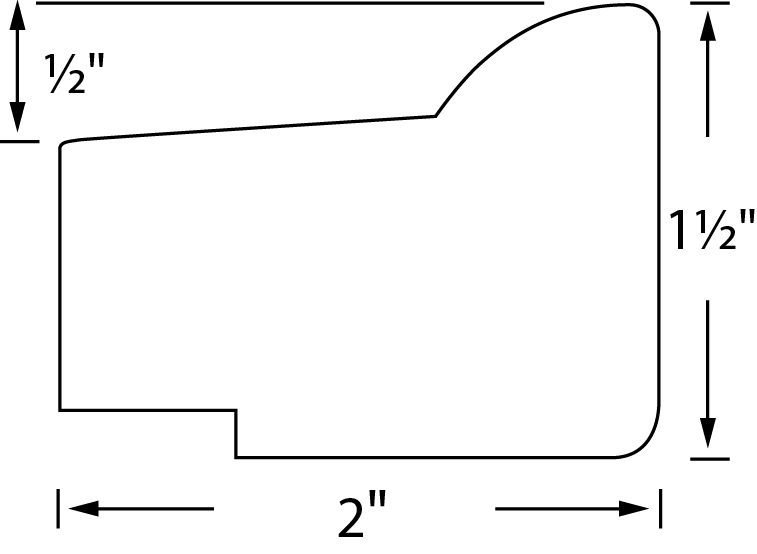 Assembly requires Aluminum Corners, item #895020-04. While available in lengths as short as 8″, BEST Heavy-Duty and BEST Aluminum bars should always be used for paintings with dimensions exceeding 47′. Unique to Jack Richeson & Co., Inc.—Aluminum Combination Pro Bars are museum quality stretcher bars for the professional. Kiln-dried pine is connected to a specially milled 3/32″ aluminum bar. Paintings will never twist, warp, bend or change from dryness or humidity. The recycled aluminum stock provides a structural frame of total strength and stability. The pine outer bar offers a smooth, rounded edge and a solid surface for stapling. Pro-Bars can be cut to any length and assembled with steel corner inserts. 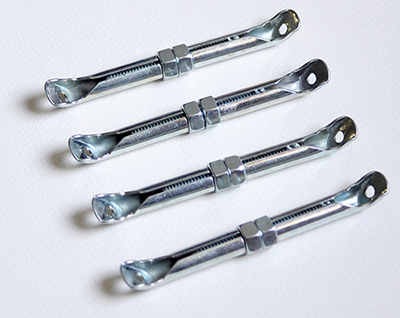 Optional BEST Keys allow tightening or loosening of the canvas with the turn of a nut. 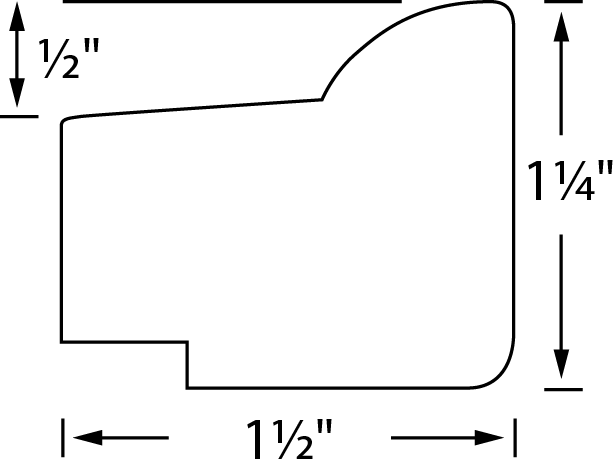 Assembly requires Aluminum Corners, item #895020-04. While available in lengths as short as 8″, BEST Heavy-Duty and BEST Aluminum bars should always be used for paintings with dimensions exceeding 47′. 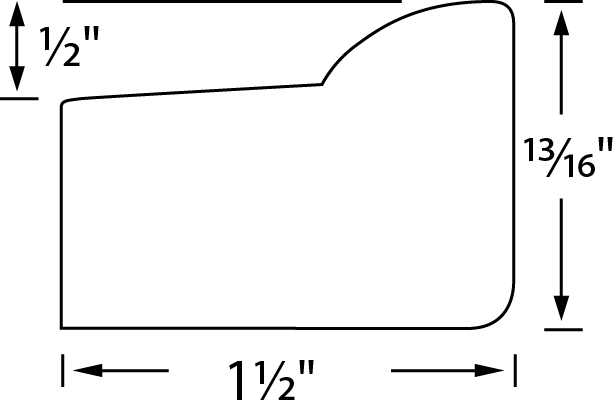 NOTE: All BEST Stretcher Bars are cut 1/8″ shorter than the measurement listed. This is to ensure that the assembled frame with canvas will fit into a picture frame. If exact measurements are required, please call 1.800.233.2404. BEST Keys are an incredible innovation! A quick and easy fix for wrinkled canvas as the result of improper stretching technique or the warping of time. BEST Keys can be used to fix canvases or to prevent future problems. BEST Aluminum Pro-Bars are pre-drilled for BEST Key use. BEST Keys take the place of obnoxious wooden corner keys (which may fall out or harm the canvas) ensuring a tight canvas fix. Most canvas wrinkles are the result of only a few centimeters of canvas slack. Best Keys eliminate the need to remove and restretch the canvas, which can potentially harm you, your canvas, or your stretcher bars. For a quick introduction to Best Keys, check out the video! BEST Keys specific time: 0.57. NOTE: Each kit contains a set of four keys which can be mounted by using the pre-drilled holes on the Aluminum Pro-Bars or by making your own with a 3/32″ drill bit on wooden stretcher bars. Keys are optional, but highly recommended if tightening and loosening of the canvas is desired. Can also be used on wood stretcher bars. Aluminum Corners are used to join Aluminum Combination Pro Bars or Aluminum Gallery Wrap Bars. Only one corner is needed for each join; however, two Aluminum Corners are recommended for optimum strength. These are a simple but worthwhile accessory to protect paintings. These corners are an exact 90° angle. The predrilled holes make mounting easy. To ensure that canvas corners will remain square, attach one panel to each of the four corners of the canvas. They are removable and can easily be added after a painting is done. An innovative approach to using cross braces! 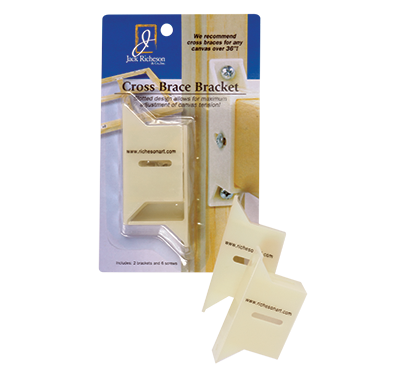 Designed to fit all sizes of Richeson Cross Braces, our sturdy cross brace bracket is the ideal way to support a stretched canvas. State of the art design works with all sizes of BEST stretcher bars. Slotted design allows for future adjustment of canvas tension. Where are BEST Stretcher Bars made? BEST Artist Products are made in Kimberly, Wisconsin, USA. When you buy BEST products, you are supporting American workmanship. A good product reflects well on the artist. Why does “Made in the USA” matter? Paintings that say “Made in China” or “Made in Mexico” will typically command a lower price. 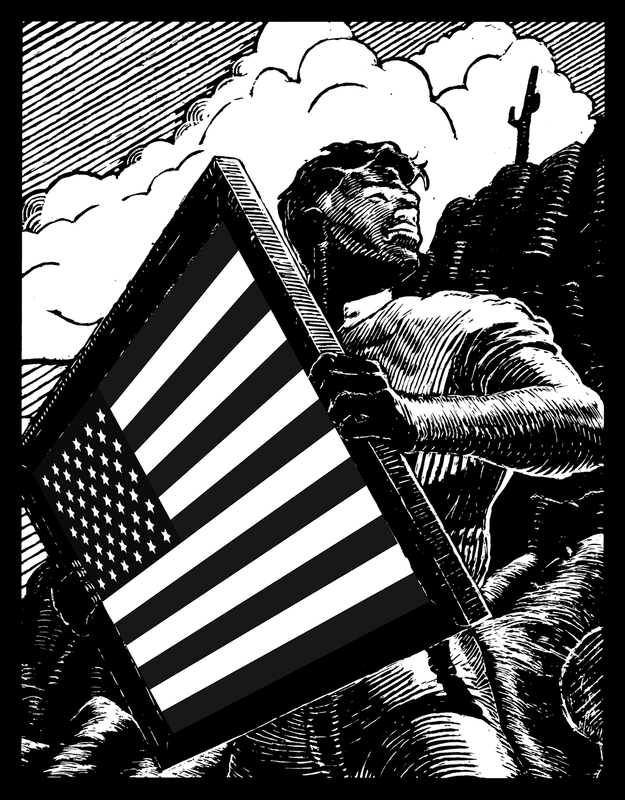 USA-made products increase the value of your artwork. Stretcher bars are required by law to state where they are manufactured. If your bar does not say where it is made, demand to know. It matters. Can where my bar is made effect the quality? Most stretcher bars found in art supply stores are manufactured in China or Mexico. However, neither of these locations have ideal climates for creating the perfect stretcher bar. Bars manufactured in China typically are made in the humid coastal area. Bars manufactured in Mexico are made in a dry, arid climate. Because wood is a natural product, it has some moisture in it at all times. Drastic climate changes will cause the wood to react. Stretcher bars that are manufactured in a humid climate often shrink or crack when shipped to a drier climate. Stretcher bars that are manufactured in a dry climate often expand or warp when shipped to a humid climate. Wisconsin is a perfect place for manufacturing wood products like BEST Stretcher Bars and Easels. The climate is temperate enough to ensure consistent, quality product. Why are BEST Stretcher Bars cut 1/8″ shorter than the listed measurement? BEST Stretcher Bars are cut 1/8″ shorter than the listed measurement to ensure that your assembled frame when wrapped with most any weight canvas will fit into standard picture frame sizes. For example, if you assemble a 9″ x 12″ frame with standard stretcher bars, the frame will be 9″ x 12″. When the canvas is stretched over the frame, more width is added to the frame, and your canvas will not fit into many standard 9″ x 12″ picture frames. You will need a custom frame, which can be expensive. BEST Stretcher Bars solve this problem. 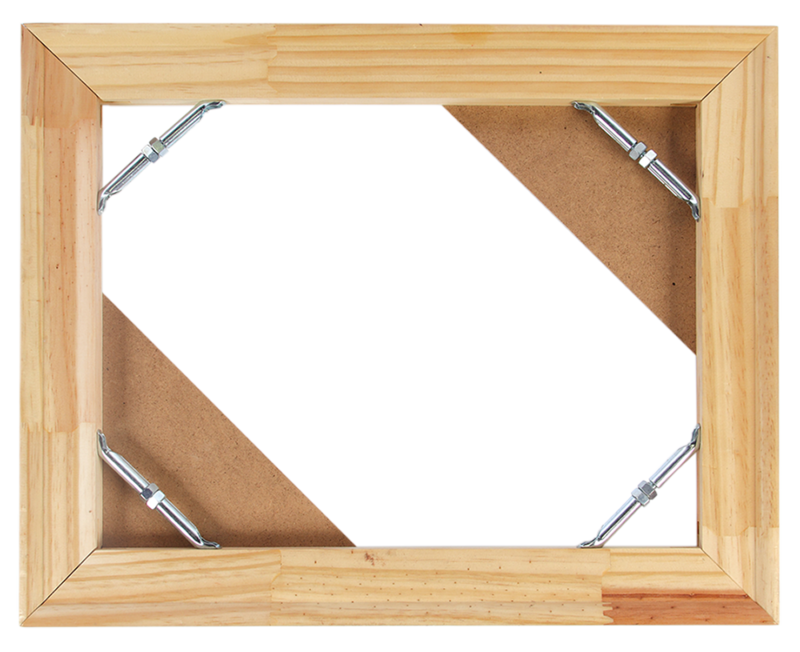 When stretcher bars are cut 1/8″ short, the assembled canvas will fit perfectly into the standard picture frame size. BEST Stretcher Bars are made using finger jointing. What does that mean? Finger jointing is a process of joining pieces of shorter wood into long, stronger pieces. Complementary triangles or rectangles are cut into the wood and then glued to join the pieces. This allows for longer, stronger, straighter stretcher bars. The glued wood is stronger and more stable than unglued wood—resulting in better product for you! Are BEST Stretcher Bars expensive? Not at all. For pennies more than standard imported stretcher bars, you get a thicker, stronger, straighter, U.S.A. manufactured quality product. What is the difference between stretcher bars and stretcher strips? Stretcher strips preceeded stretcher bars. However, when John Rise, founder of BEST Artist Products, created his stretcher bars, he included a higher rise than stretcher strips. This extra height keeps the canvas from pressing against the bar resulting in “ghost lines” which are difficult to visually fix in a painting. After John Rise's innovation, most companies started making stretcher bars with higher rises; however, stretcher strips are still often used in low-cost pre-stretched canvases. 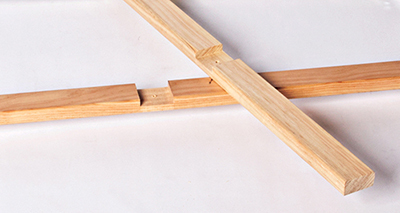 Can I use BEST stretcher bars with other stretcher bars to create a frame? No. BEST stretcher bars are designed to join properly with other BEST stretchers. This ensures an overall quality frame. If you don't find the size of BEST strecher bars you're looking for, call us for a quote and test our limits. We have made custom aluminum frames as large as 13 feet by 22 feet! How do I choose which BEST stretcher bar to use for my art? For small canvas or lightweight works of art, Lightweight Stretcher bars are ideal for both students and professionals. For light works longer than 60″ or heavier 38″ works, Medium-Duty bars are preferable. For heavy or large works, artists should be using the Heavy-Duty, Aluminum Combination Pro, or Aluminum Gallery Wrap Bar. For heavy and large pieces, we recommend reinforcing your frame with BEST Cross Braces. Why should I use BEST Aluminum Combination Pro or BEST Aluminum Gallery Wrap Bars? Aluminum will hold the wood frame straight for centuries. Aluminum will not change or warp over time like wood. Having a joint aluminum/wood frame allows the painter to build a frame in the traditional manner without having to worry about the effects of time on a pure wood frame.